Many analysts say that Modi’s image, recently dented by slowing economic growth and allegations that the governing party had suppressed a report showing a 45-year high in unemployment has recovered since a military confrontation between India and Pakistan, and has perhaps even strengthened ahead of the vote. Amid growing fears worldwide about the power of social media to manipulate voters, India’s election commission said it would closely monitor platforms like Facebook. General elections in India will begin on April 11 with some 900 million voters eligible to cast ballots to fill parliamentary seats and chose the next prime minister in the world’s biggest democracy. The elections, which will be held during a period of heightened nationalism in India, are a crucial test for the governing center-right Bharatiya Janata Party, the BJ.P, and for Prime Minister Narendra Modi, who is running for a second five-year term. Many analysts say that Modi’s image, recently dented by slowing economic growth and allegations that the governing party had suppressed a report showing a 45-year high in unemployment has recovered since a military confrontation between India and Pakistan, and has perhaps even strengthened ahead of the vote. Amid growing fears worldwide about the power of social media to manipulate voters, India’s election commission said it would closely monitor platforms like Facebook. The election voting would be held in seven stages, staggered across the country, before polls closed on May 19. Ballot counting will begin on May 23 and is expected to be completed in a day. 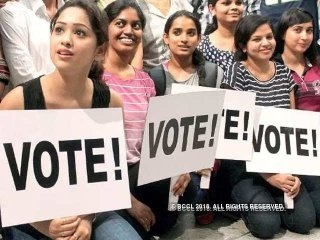 Voters will effectively choose India’s next leader by filling more than 500 seats in the lower house of Parliament, the Lok Sabha. The elections are largely a contest between the BJP, Bharatiya Janata Party and the Indian National Congress, the party of Rahul Gandhi, which has led India for most of the country’s post-independence history. The vote will be the BJP’s to lose, analysts said. In 2014 general elections, the BJP picked up more than 280 seats in the Lok Sabha and wrested a majority from a coalition led by the Indian National Congress. More than 500 million people voted in that election. In the aftermath of the recent military confrontation between India and Pakistan, Prime Minister Modi has tapped into an intense nationalist current running through the country. Last month, a suicide bombing in the disputed region of Kashmir killed more than 40 Indian troops — the worst attack there in 30 years. The bomber is believed to have belonged to the militant group Army of Muhammad, or Jaish-e-Muhammad, which is active in Pakistan despite being banned by the government there. In response to the attack, Indian warplanes crossed into Pakistani airspace to strike what Indian officials said was a training camp for the militants. The aerial incursion was the first time Indian aircraft had crossed into Pakistan in decades. The tensions escalated into an aerial dogfight that ended when a Pakistani jet shot down an Indian warplane and Pakistan’s military captured the pilot. In a ‘good will gesture’, Pakistan handed over the Indian pilot this month, defusing tensions. What are the plans of Prime Minister Narendra Modi and his party the BJP? Modi pledged to spend 1,44 trillion dollars on infrastructure to boost the economy and raise living standards, in a bid to match its main rival’s populist promises. The BJP, which is seeking to retain power in elections released its ‘manifesto’ in New Delhi recently, reiterating its pledge to double farmer’s income by 2022, improve GDP share from manufacturing and double exports. India’s 263 million farmers are a key voting bloc in the world’s largest democracy. The main opposition Congress Party has promised to write off farm loans throughout the country. To match it, BJP said it would invest 25 trillion rupees, 359 billion dollars in rural development and offer farmers 6,000 rupees per year in income support. The infrastructure promise ties in with estimates reflected in the 2017-18 Economic Survey document by former adviser and economist Arvind Subramanian, who pegged the needed investments at 4.5 trillion dollars till 2040. BJP’s figure is roughly one fourth of this requirement. In comparison, the government has set aside 57 billion dollars for spending on roads, railways and airports in the year ending March 2020. The manifesto lists banking reforms and lower inflation as achievements that can help raise funds for building infrastructure but gives no details of how the party will ensure funds will be raised. "The essence of the manifesto is to deplete poverty to single digits in next five years and then eventually eliminate it," said Finance Minister Arun Jaitley. “The manifesto has been prepared with a strong nationalist vision. It also promised to take its flagship programs, providing toilets, electricity connections, houses, cooking gas, crop insurance and loans for small business, to more beneficiaries by allocating additional resources,” said Arun Jaitley. The ruling party, which is leading in opinion polls, is offering giveaways to stave off a challenge from Congress, led by Rahul Gandhi. Congress has promised in its manifesto to rid India of poverty by 2030 by providing income support to the poor, waiving farm loans and creating jobs. The BJP is playing catch up with congress. It looks like a fusion of populist nationalism and majoritarianism. After all their criticism of the Congress about being shallow on specifics in their ‘manifesto’, the BJP’s own document lacks in detail. Modi has been criticized by the opposition for not fulfilling his promise of creating 10 million jobs each year, a pledge that helped him win over India’s youth in the 2014 election. The ruling party denies this charge. The boost to infrastructure will also ‘lead to the creation of a large number of jobs and livelihood opportunities’, the manifesto reads, noting the government would target ‘untapped employment-generation of a potential of sectors such as defense and pharmaceuticals’. We’ll see the end of next month what the position will be of Prime Minister Modi. He is pitted against a variety of opposition parties who could come together to unseat him. Recent weeks have shaken up the race and we’ll see what his main opponent Rahul Ghandi, scion of the most famous dynasty in Indian politics, the Nehru-Gandhi clan shall beat Narendra Modi.